QUESTION: Mr. Armstrong; It is obvious that so many people try to copy your work and pretend it is their original work. 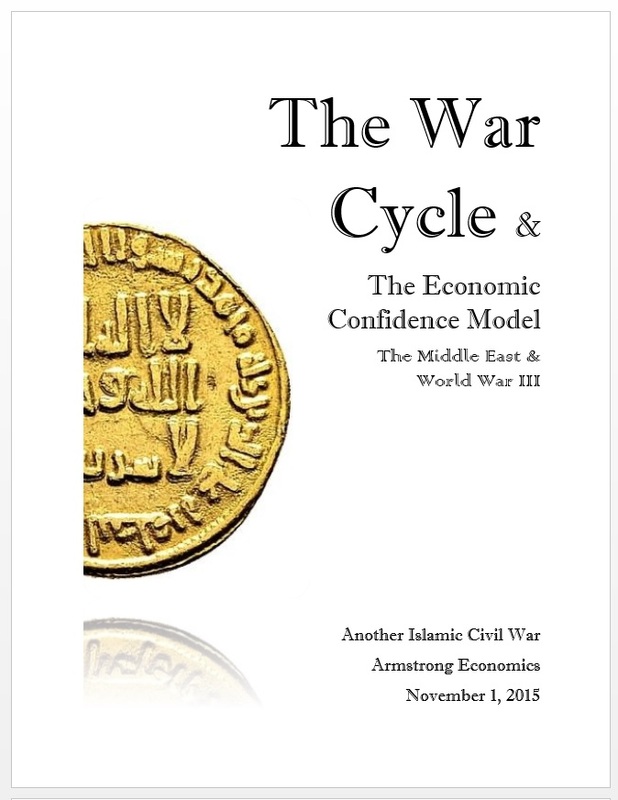 The Cycle of War is a classic example. No matter how much they fudge everything, your models work to the day and that is just mind blowing. Nobody has been able to duplicate your work no matter how much they try to take everything you do and turn it into some scam. Do you think this will be World War III since Russia entered the Middle East right on the day of your model? ANSWER: We are preparing the new update of The War Cycle. This will be provided to those attending the World Economic Conferences. This report goes into a lot of detail with the focus being on the Middle East and the result of Russia’s entry into Syria on the very day of the model. This is correlated with the Economic Confidence Model (ECM), and the prospects of the future are rather shocking. Whenever something responds to the very day of the ECM model, it warns that this will be the focus. This will be made available to the general public at $75 since it is very important to understand from a sociological perspective. We will post a link when it is ready for delivery.